Body Parts: The Causes Of Obesity. 1: What Is Obesity? The Causes Of Obesity. 1: What Is Obesity? Obesity is usually described as a single phenomenon, whose presence is indicated by a body mass index of 30 (National Institute of Diabetes and Digestive and Kidney Diseases, Wikipedia). With this rough indicator, public health officials are agreed that the United States has seen an enormous increase in obesity over the past twenty years. In 2007, over thirty American states had obesity rates equal to or higher than 25% (CDC). 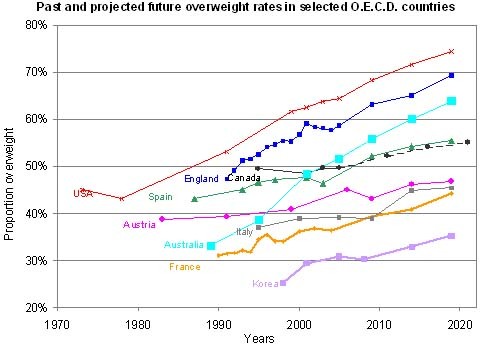 Europe has also seen a dramatic rise in the rates of obesity (International Obesity TaskForce). In the UK, one-third of children are over-weight or obese (The Independent). In France, long considered the model of dietary health, the rate of obesity has recently doubled to over twelve percent for adults (Bio-Medicine). Sections of the world that were once poor and presented sad images of impoverishment, now see obesity. The Middle East is experiencing a sharp rise in obesity; in Saudi Arabia, sixty-six percent of women are obese (Arab News). China has seen its rates of over-weight and obesity in children (taken together) increase 28 fold in two decades (Buzzle). India is seeing rates of obesity in its new, prosperous, urban, middle class rise so rapidly as to cause alarm (Guardian [UK]). What has caused and is causing this alarming rise of obesity? Medical popularization simply explains obesity as a result of consumption of too many calories in food and expenditure of too few calories in exercise (for instance, the CDC). This explanation has some intuitive credibility, but it is not clear that there is such a phenomenon as "caloric balance". Ingestion, digestion, absorption, and utilization of food, as the source of calories, is not a unitary phenomenon. Each of the major steps in food intake and uptake is conditioned by numerous factors, involving, not only nutrition, but also repair and maintenance of the stomach and intestine walls and the operation of the immune system. Moreover, the time frame in which balancing occurs varies. Should caloric uptake and expenditure be accounted by day, or week, or season, or year, or does it occur over major multi-year stages of life? A common experience concerns the effect of health and illness on food. In some illnesses, such as the flu, we find ourselves without appetite and lose weight rapidly, over a few days to a week. With other illnesses, the medicines we take, such as anti-depressants for depression, force us to gain weight, over months and years, even though we might reduce caloric intake to try to prevent it. Further, food intake and uptake are different physiological processes in children and in adults. Adolescents are notorious for consuming enormous quantities of calories, over several years, and yet, growing rapidly, not becoming obese. The notion of a caloric balance is of minor use in analyzing these situations. Stimulated by evidence that bacterial (and viruses) inhabit previously unsuspected parts of the human body, the (US) National Microbiome Project, funded by the National Institutes of Health, has for the past five years conducted research into microbe-human mutualism and pathologies in their many respects (Michael Balter, "Taking Stock of the Human Microbiome and Disease", Science: 336, 8 June 2012, 1246-7). Evidence of the role of ubiquitous bacteria in diseases is now pouring in. Some of the evidence is observational, without biochemical, genetic, and other cellular level detail; but the evidence is overwhelming about the complicity of bacteria in many diseases, especially "autoimmune" diseases and inflammatory diseases. As described by Nicholson et al., our bodies are bathed with microbial molecules, generating a host-microbial molecular embrace. Recent studies have shown that the immune response to these microbial molecules profoundly impacts the metabolic health of mammalian hosts. How we conceptualize obesity is also changing. The general view now is that obesity is a condition that leads to diseases; but some professionals in public health and medicine are now considering defining obesity as a disease in itself that causes other diseases. For instance, if we consider some of the manifestations of obesity besides extreme overweight , such as the presence of inflammation, then obesity is a disease (PPAR Research). No doubt, as medical research science discovers more about the body chemistry of obesity, we will continue to see obesity associated with pathological processes in the intestines, the vascular system, the major digestive organs, and cells around the body. For reasons of the complicatedness of obesity's manifestations, it perhaps better to discuss "obesity" as a general category for a variety of health and medical phenomena and disease symptoms. Someday, I suspect, we may distinguish between "obesity I," "obesity II", and so on, just as we now distinguish between "diabetes I", diabetes II", and "diabetes III". (Some medical researchers are coming to re-conceptualize Alzheimer's disease as related to diabetes. The association is supported by recent research showing that insulin treatment can slow or stop the progression to Alzheimer's disease.) In a similar vein, in the 1950s and 1960s, schizophrenia was thought to be a single mental disease, now it is understood to be a group of different diseases. Some symptoms once thought to be characteristic of schizophrenia are now realized to be the product of different diseases, such as depression. In this cautionary medical tale, we have reason to believe that more research will help us to understand that obesity is not a unitary phenomenon, but a cluster of distinct pathological and medical disease states. I suggest we rename obesity as "obesity spectrum diseases". If obesity is not a unitary phenomenon, therefore, the search for causes of "obesity" will be more complicated than we now believe. We will have to distinguish different kinds of "obesity" and associate each kind with different causes--different environmental and social causes, different pathways of pathology, and different disease states. In my next discussion, I will look at how we might conceptualize the causation of "obesity", considered as multi-form pathological states masked by the singular, phenomenological indicator of BMI of 30. Revised. January 15, 2009, February 16, 2010, September 21, 2010, September 24, 2010, October 16, 2011, July 4, 2012. Is It Lack of Exercise?